Join the discussion on our forums! 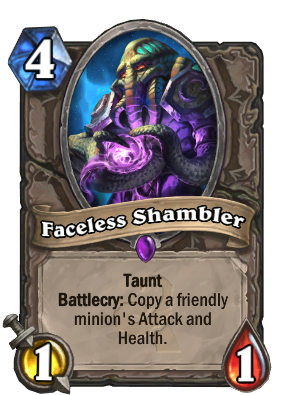 Come discuss Faceless Shambler over in our dedicated Faceless Shambler discussion topic. Battlecry: Copy a friendly minion's Attack and Health. "What is that thing?!" "I'm not sure, but it seems to be sort of Ysera shaped." Once you get into later golem levels it should be easy to summon a golem and drop this on the same turn for some nice tempo and a strong taunt minion to turn the game around. It's pretty meh before then, but at least it could be an emergency taunt. does this card work with hand buffs? Or will the handbuff stats be replaced? I got 4 of this guy. Thanks blizzard. This may be the Strongest Taunt in the game, besides Soggoth the Slitherer. It has to target a friendly minion,which is fine, and is best played at a turn 10 with a big card or with a big minions to survive. 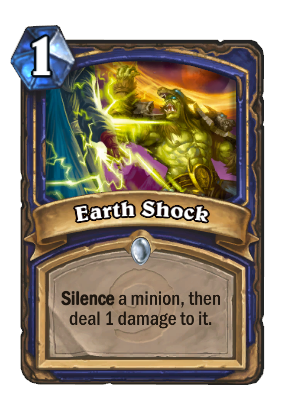 Removal isn't really a problem,if it's big enough, silence is annoying(but not as bad as silencing Twilight Summoner rip) but is other wise okay. Only real counter is The Black Knight, which is coming back in the meta, but usually only run if you have it(and what are the chances). Bolster is amazing on this as well, and Power Overwhelming is just that.. That's just my thoughts on it, saved my skin a bunch of times. You know how Op this could be with Brann Bronzebeard? Not very; the card text says "copy" not "add to.t would simply copy the targeted minion's stats once and the copy those values again. This card is great in C'Thun druid. I'm using it (1 copy) on Klaxxi Amber Weaver (4/10 stats). For 8 mana even if you have no board you can pull off Klaxxi and then this card to have a 4/10 minion and a 4/10 taunt. It is great compared with ancient of war where you expect one 5/10 for 7 (1 less) mana. A few days into this meta and as expected after the nerfs, silence is rarely run and comes at a premium. So again as expected, the comments here saying how weak it is to silence are not relevant at all. As for the card itself, it is still finding its way (it's way too early to say what the meta will evolve into - at least a month should be allowed for that), but it has potential. It looks good for copying good HP and attack values from otherwise "dead" minions. The first deck coming to mind that you could tweak for that is Silent Druid. Google a few lists from a few months ago and start tweaking them for Standard, or just proceed with Wild. I would do that, but at the moment I am more interested in trying out the other major decks that have come up. PS. Honestly guys, I don't know what to make of this card. I have been (un)lucky enough to get him 3 times, once in golden (dusted), and I haven't found a good use for him. His mana cost means that you need to copy 4+ mana minions with excellent stats, otherwise it's a waste. Pretty significant limitation - you might as well include a more concrete win condition. I've never seen him on ladder and streams, either. Been having great success with these in Handlock after swapping them with my Moltens. After the nerf - and sort of even before - Moltens were just a dead card sitting in your hand until things got dire, but with these I can usually, at worst, get a Yeti with taunt by using it on an Ancient Watcher. And that's not even to say what happens with bigger minions. Coin out a Drake on turn 3, then Shambler it on turn 4, or a Mountain Giant, etc. Obviously worthless when silenced, but that's a risk I am more than willing to take. Also, it copies remaining health, not total. Another "I hate Earth Shock" card. Does this work on Jaraxxus or no? If you summon him as a minion, like out of Y'Shaarj or something, but otherwise no. If Jaraxxus became your hero, he's not a minion. Use Emperor Thaurissan for 6 mana, and then pull this combo in turn 7..
You get two 48/48 with taunt. Every creative comments always spoiled by the likes of this. Does this combo with hobgoblin? Buffs a bunch of deck archetypes that needed help! What a shame it's so terrible in Silence Druid.